TOKYO, Japan, September 22, 2011 (ENS) – Typhoon Roke has been downgraded to a low pressure system and is moving northeast after making landfall Wednesday on the Pacific coast of Japan’s largest island of Honshu. The storm has claimed 12 lives in six prefectures, from Nagasaki in southwestern Japan to Kanagawa next to Tokyo; four other people are missing. Across the country, 367 people have been injured. The Japanese Meteorological Agency says that the typhoon made landfall near Hamamatsu City, Shizuoka Prefecture at around two Wednesday afternoon, bringing strong winds and heavy rain to western and northern Japan. The agency is urging maximum caution against potential mudslides, floods, strong winds and high waves. 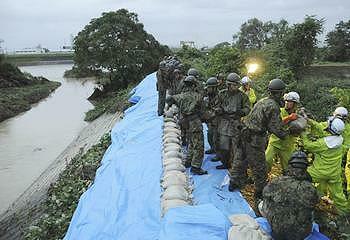 More than 1.2 million people from 512,000 households in western and central Japan were urged to evacuate today. Some 7,800 people from 3,700 households across the country were ordered to evacuate as of 11 this morning. More than 1,000 homes in 30 prefectures have been flooded by heavy rain. Nearly 90,000 households in 13 prefectures have lost power. Automakers Toyota, Nissan and Mitsubishi closed their manufacturing plants to help ensure that workers can be with their families as evacuations continue. 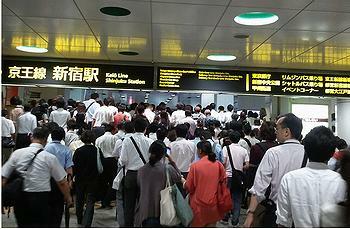 Typhoon Roke disrupted the country’s air, road and bullet train services. The typhoon has caused the cancellation of more than 300 domestic flights and the suspension of Tokaido bullet train services between Tokyo and Osaka, and Yamagata shinkansen services between Shinjo and Fukushima stations in northeastern Japan, according to airlines and East Japan Railway Co.
Several highway sections, including the Hokuriku Expressway, were closed. Tokyo experienced winds with gusts reaching 83 mph; some 20,000 residents lost power. Heavy rain is expected across a wide area of Japan in the coming 24 hours. On Wednesday, Typhoon Roke was moving northeast at a speed of 50 kilometers (30 miles) per hour, packing winds of up to 155 kilometers per hour (96 mph). On Wednesday night, the storm reached Fukushima Prefecture, devastated by the March 11 earthquake, tsunami and subsequent nuclear emergency. The storm was expected to strike the Fukushima Daiichi nuclear power plant that was damaged by the earthquake and tsunami. It brought heavy rain and high winds to Fukushima on Wednesday night, but inflicted no major damage on the crippled nuclear plant. Owner-operator of the power plant, Tokyo Electric Power Co., said there was no additional damage to the nuclear facility, but it did raise the levels of radioactive water in several of the turbine buildings. Rainfall of up to 250 millimeters (10 inches) is expected in the area through Thursday noon, but TEPCO says radioactive wastewater is not likely to overflow from the reactor turbine buildings. For fear of storm surges, work at the nuclear plant was halted. Outdoor piping and pumps for injecting water into the reactors were secured with ropes to keep them from being blown down. 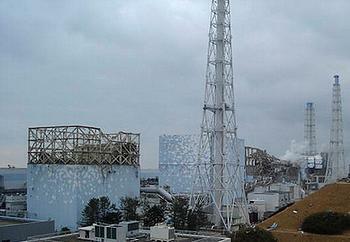 High winds and heavy rain forced the suspension of work to cover the Unit 1 reactor building at Fukushima Daiichi. The cover is being installed to contain radiation after a partial meltdown of nuclear fuel in the reactor in March.